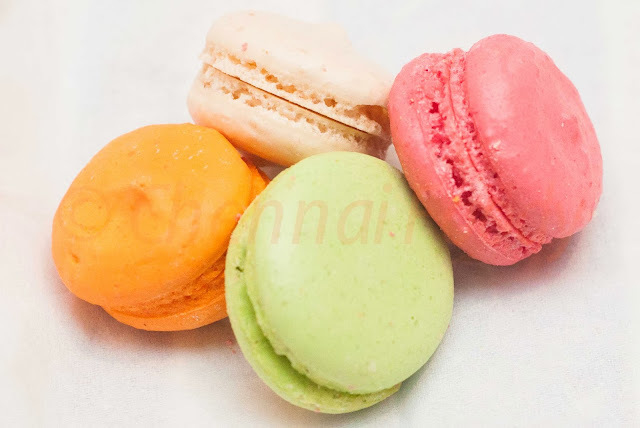 So I wrote about the rather bad macarons at one of the coffee shops in town last week! So where then do you get good macaron? Accidentally on my way back from the airport, I was hungry and stopped at Hilton's EST, a coffee shop that has reasonably good food and definitely cheaper than the ridiculous food prices at the Chennai airport. Apart from being ridiculously priced, they are ridiculously sub standard! When you charge so much for food, you might as well give something edible! Any way, not to deviate from the topic, I picked up a veg quiche priced at Rs. 95 in a 5 star property and though it wasn't the best quiche I have had before, my eyes spotted the macarons in various colours and the quiche was forgotten! 100g is priced at Rs. 140 plus tax and they give you about 14 pieces for 100g. Compare that to the 50 bucks for two (bad macarons) at the local coffee shop! After she packed the 14, she was gracious enough to give me one, 'just like that for you, sir,' with a broad smile! And while I was being billed, she gave me one more! Two weeks later, I was back at Hilton and picked up another 100 g, but this time, I got only one free. These macarons were soooooooooo good. They looked like a French Macaron with the feet and the colours and the ganache and though the tops were not super smooth, they are the best I have had here! Five flavours, all good and they disappeared in one night. Crunchy on the outside, slightly chewy and much less ganache the the traditional French macarons, but they were good enough for me here in Chennai. EST is the Coffee Shop at Hilton, Kathipara Junction.